On this page we try to keep you informed of news which pertains to prophesied events and the underhanded evil ways order's so-called "elite." As you may already be aware, they have their hands deeply involved in a multitude of events, many of which the unsuspecting public is not aware. If you're aware of the Georgia Guidestones, you may NOT know they've been recently updated: The year number 2014 was added last week! This newscast comes from the well-respected RT (Russia Today) group. You certainly WON'T hear any of this on the American mainstream media. Our media are in bed with the Globalists, who OWN them! This is a very chilling report with credible sources you can check out for yourselves. The Globalist Beast power controls the world's most powerful nation which they plan to use for a FIRST STRIKE in a nuclear WWIII. The Globalists are behind ALL the civil unrest happening globally, including what's happening here in America. The most recent events are being staged in the St. Louis, MO area - in the town of Ferguson. They're militarizing police, while sending in the new Black Panthers and other rioters. Their ultimate end is Martial Law and dead Americans! This informative video was posted on YouTube's Alex Jones Channel nearly a month ago - July 17, 2014. As the Middle East explodes into WW3, the NWO plans to use our own military against us in a Martial Law takeover of America! It's illegal, but the NWO is lawless. Are you watching and praying at all times, as our Savior Yahusha HaMashiach says to do? We need to pray for one another like never before, because we're living in the worst time that has ever been or ever will be!! Did Yahuah protect Israeli citizens from this Hamas bomb? We at 4thelostsheep.com believe He did. Breaking News!! Ebola virus has come to the U.S.!! Alex Jones educates you on the New World Order and the UN Agenda 21. This monologue will put things into perspective, such as the recent attempt by the BLM to take down the Bundy Ranch in Nevada and other land grab scenarios. It's all PLANNED!! Have you been wondering about the ISIS crisis? David Ike tells us the whole scenario and how it will be used to create World War 3! Obama signs another anti-American Executive Order to bring in MORE illegal immigrants, as if we don't have enough already! Do you know who controls the Illuminati? YouTuber David Vose tackles this question and more! Lines are being drawn. All must choose between worshiping the Creator or His adversary Satan, the devil. Hint: if you're part of any organized mainstream religion, you're on the wrong side! The film, "Top Priority: The Terror Within," which Julia Davis and her husband B.J. made depicting their ordeal can be purchased at http://topprioritymovie.com/. We plan to purchase it and offer it on this website in the near future. Though it hasn't become full-blown worldwide, as yet, for some, the end-time Great Tribulation has definitely begun. The following message comes from a Seventh Day Adventist. We actually considered putting this on our Home Page, but chose this one, instead, because everything you see and hear in the news has been planned, orchestrated and executed by the Jesuits. They are the true power behind the pope and this video names many names. And then, I found this! According to a reliable source, OAS will be a BLOODBATH! U.S. Soldiers are speaking out against the deception of our Beast government! More on the Bundy Ranch in Nevada: Notice the beast govt has turned everything around against Bundy and his supporters. This is what true evil does. Stuff like this is going on all over the world, but especially, here in the United States. The producer of this video, David Lory VanDerBeek, is running for governor of Nevada. He's a man for the people. Homelessness has become a CRIME now in some areas of the U.S.
Obama Care is really a euthanasia bill! A must watch!! MORE, Government Land Grab,,Anymore To Add To The List? (5 MILLION ACRE LAND GRAB) Colorado Ranchers Angry Over Army Site Expansion: A government betrayal, The U.S. Army wants 418,000 acres of private ranch land. But the government's appeal to patriotism when ranchers could be forced to sell property that has been in their families for generations leaves many landowners cold. They remain skeptical of the claims of national security and frustrated by the lack of answers.They are also infuriated by what they consider callousness among proponents of the expansion, such as the comment from state Sen. John P. Morse, a Colorado Springs Democrat, that "patriotism is about accepting your cost, even when it is disproportionate." "It's rude. It ain't right. It's not American," said Stan White, who could lose more than two-thirds of the 9,000 acres he ranches in Walsenburg. "We take our military and our country very seriously, but we're up against something we can't get a hold of. If they get this done, it's a national disgrace." U.N. AGENDA 21 TO SEIZE 17.8 "MILLION" ACRES FROM MISSOURI AND ARKANSAS: Do not let anyone tell you that this White River Watershed National Blueway is not a Federal land grab. The whole purpose of this Blueway is to take over ALL land and Surface Water. You need be be familiar with Agenda 21 and the Wildland project to understand the goals are to rewild over 50% of the United States. Here is some information on the Explanation of the Biodiversity Treaty and the Wildlands Project. SENATOR JIM DEMINT TOOK TO THE PAGES OF THE WASHINGTON POST TO RAISE THE ALARM ABOUT A PLANNED "10 MILLION ACRE" WESTERN LAND GRAB BY THE OBAMA ADMINISTRATION: The leaked document lists 17 sites in 11 states that could be designated as national monuments through the federal Antiquities Act. Over 380,000 acres in Colorado are designated in the memo under the heading "Prospective Conservation Designation." Senator Jim DeMint took to the pages of theWashington Post this morning to raise the alarm about a planned, 10 million acre Western land grab by the Obama administration. A secret administration memo has surfaced revealing plans for the federal government to seize more than 10 million acres from Montana to New Mexico, halting job- creating activities like ranching, forestry, mining and energy development. Worse, this land grab would dry up tax revenue that's essential for funding schools, firehouses and community centers. When Kit Laney answered a knock on his door Saturday, law enforcement officers from the U.S. Forest Service handed him a piece of paper announcing his Diamond Bar Ranch in southwest New Mexico would be shut down Wednesday and his 300 head of cattle grazing there would be removed -- one way or the other. THE GREAT LAND GRAB RUSH FOR WORLD'S FARMLAND THREATENS FOOD SECURITY: THE OAKLAND INSTITUTE SOUNDS THE ALARM ON THE THREAT THAT LAND GRABBING POSES TO FOOD SECURITY AND LIVELIHOODS. The purchase of vast tracts of land from poor, developing countries by wealthier, food-insecure nations and private investors--have become a widespread phenomenon, with foreign interests seeking or securing between 37 million and 49 million acres of farmland between 2006 and the middle of 2009. Read about the report on Land Grabs and Threatened Food Resources in their documents. It is about time we ALL People finally join together to stop this Corrupt System of ALL who Enslaved us into their System. We need to do this the right way, Just keep in mind at all times,,Power in Numbers.. This is Why The BLM Wants Cliven Bundy's Ranch Gone You're gonna wanna take notes﻿. Here are more Folks dealing with Corrupt Government. Will the U.S. government take away Cliven Bundy's rights or will we, the people, win out? We seem to have won a battle, but the war is far from over. The current state of America and the world is not good. We are, in fact, on the verge of WW3, the Abomination of Desolation spoken of by the prophet Daniel and the Great Tribulation at the end of the age. Are you ready? Stop eating!! It's killing you! Warning: this is NOT a joke! How prepared are you to live OFF THE GRID? We know Yahuah will deliver His own to a place of safety. Are you a First Fruit? Do you know for sure? If you can't answer an affirmative, "YES" to these questions, you may not be a First Fruit. Even if you are, what about your grown children? You should have some food and water prepared for the inevitable eminent economic collapse in the near future. What about Martial Law? You need to watch this one! Will Obama be impeached, as some are calling for, or willgenocide prevail in America and throughout the world? Russia is warning us of an Extinction Level Event that appears eminent. Don't worry, though. Yahuah protected His people in the U.S. recently from 3 nukes that the Beast government meant to explode here on American soil. Read Revelation 7. He will continue to protect us - until He takes us out to the place of safety! Now, this next video gives out some good advice: make friends in your local police department and with DHS personnel (if there are any in your area) and try to talk some sense into them, letting them know that they're being used by the world's evil leaders to destroy their own country - America. Some world news links of interest. Please share with all who will hear the Truth. Wormwood is on its way to Earth! As we have shown you previously, the object which NASA calls "Comet ISON" is actually Nibiru, a dwarf star which passes through our solar system every 3600 years. It's here now. You may want to watch this. As we know from Scripture, the powers of the heavens will be shaken in the end-time. This is that time; however, we also know that Yahuah promised Noah that He would never again flood the world. We must stay close to Him and pray always. He will take care of His own! Watch the skies for the next month or so. Already we've had six times more meteors than normal this year! Could the first trumpet of the Great Tribulation be getting ready to blow? This is the time-frame we've been seeing: America, directed by the global beast system, has been doing the work of Daniel 11's King of the North, invading Muslim countries (the King of the South) one by one. This will come to a head over the next 6 months, at which time the beast system enters into Jerusalem. It will commit the "Abomination of Desolation," as the beast leader and his false prophet (the pope?) announce the birth of the New World Order. "Remember, Remember..." This short message is definitely worth hearing, especially if you're a member of law enforcement or part of the military. In the near future you may be ordered to fire upon Americans, to forcibly take away firearms from law-abiding citizens and you may be told to treat them like criminals, even terrorists. What will you do? RED ALERT!! Top secret classified information that affects every man, woman and child in America! Watch now! A perfect storm is brewing under the orchestration of ha shatan (the devil), one of many created beings which absolutely despises humanity. It will begin shortly. We don't set dates, but we think next Spring may be the time-frame. Ultimately, whenever it starts, it will be Yahuah's time-frame. WWIII has already started, because the entity entitled the U.S. started it back in 2001 on 9/11. This is the war between the king of the North and the king of the South beginning in Daniel 11:40. The southern kingdom (Islam) gets obliterated! Next, the Beast will come into Jerusalem and plant his throne there, committing the abomination which causes desolation! But, we're getting ahead of things. This video is about what's happening here in the U.S., so enjoy! This video pretty well says it all. The only things we might add are 1) Yahusha Messiah is the One who will return, not "jesus christ" and He will reign for 1,000 years! 2)The video maker skips over this millennial reign and the Great White Throne Judgment; otherwise, he tells it like it is. Great video!! We're putting this video up to show where America is now as a nation. Our government has finally shown its true colors. It's a major player in the end-time beast system and yes, civil war is coming to this country. Our police and military men must make a decision soon! We hope and pray that they choose not to fire on Americans. This upcoming video of Glenn Beck is of extreme importance. The NWO beast government is threatening to kill "whistle-blowers" - that is, any person, such as Glenn Beck, or entity, such as this website, for instance, which is warning the people against tyrannical governments. Disclaimer: we cannot condone the statements made by YouTube video up-loader "CourageousNerdz." We do not judge Glenn Beck or any man, nor do we claim any foreknowledge of who will or won't be counted worthy to escape the Great Tribulation. These things are in the hands of Yahuah. The following is a documentary created by Christopher Greene of AMTV. It shows how Obama, Hitler and other tyrants have created false flag events to intentionally disarm the people. What does it mean? (Commentary from HN News editor). Do you remember the news story that we ran about 6 weeks ago where a high level source confirmed that a secret nuclear warhead transfer had occured? Several nuclear warheads had mysteriously “left” Dyess Air Force Base in Abilene, Texas, reportedly bound for South Carolina, with no paper trail whatsoever. Apparently, the evil scheme/plot was that Obama was going to order that these nukes be detonated on or near Charleston, SC, as a false flag attack, and then move forward with his agenda: shut down the government and economy, institute martial law, then reboot the government and economy into the “brave new world” dictatorship. We have a couple of incredibly brave and patriotic Commanders from the US Navy who absolutely refused to follow the orders to detonate the nukes somewhere near Charleston. Instead, according to the report below, the two nukes were detonated at the bottom of the ocean, causing a 4.5 quake. This heroic act of intervention to prevent this terrible tragedy from happening has cost them their jobs. Obama has terminated them from their command. 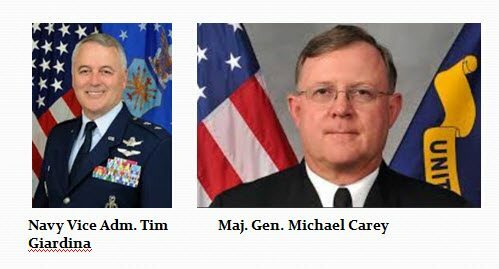 A shocking new Main Intelligence Directorate (GRU) report circulating in the Kremlin today states that President Barack Obama, while in a rage, ousted four of the United States top ranking military officers after they refused to detonate a nuclear device “in/near”Charleston, South Carolina this past week and, instead, exploded it off the AtlanticCoast. The B61-11 can penetrate and detonate below the earth’s surface, creating a massive shock wave capable of destroying underground targets. In tests the bomb penetrates only 20 feet into dry earth, even when dropped from altitudes above 40,000 feet. But even this shallow penetration before detonation allows a much higher proportion of the explosion to transfer into ground shock relative to a surface burst. Here's some news you don't hear everyday: When asked the question, "Who was America's first President?" most people would automatically blurt out, "George Washington!" Would it surprise you to find out that's the WRONG answer? George Washington was our first Constitutional President; that is, under our present Constitution. But, our first President was a man named Peyton Randolph. There were actually 14 U.S. Presidents before Washington, according to www.freerepublic.com! The Iranian situation continues to be a thorn in Israel's side, while the U.S., under its weakest presidential leadership ever, sits idly by watching and twiddling its thumbs. Will Iran be allowed to create atomic bombs to blow Israel off the map?!! If Israel must stand alone, it is prepared to do just that, according to Prime Minister Netanyahu. U.S. truckers storm Washington, D.C. with demands in hand! They're charging Obama with treason and demanding that he step down!! Where is the United States of America headed? October 2013 - Gestapo tactics greet senior citizens visiting Yellowstone Park. An unnamed Park Service official said park law enforcement personnel were instructed to “make life as difficult for people as we can. It’s disgusting.” This is NOT the "Land of the Free" we all grew up in! Obama has always compared himself to our 16th American President, Abraham Lincoln, and for good reason (hint: not the reason his supporters believe!). "The End of Mankind" uncovers a little known NASA document about the plans of the NWO elite. EVERYONE needs to see this and understand. This IS the end-time Great Tribulation we read about in the set-apart Scriptures. Alex Jones gives out info exposing the NWO globalists and naming names! Their endgame is slavery and control of all people worldwide (world government) and ultimately, they want to murder you! They are greedy, selfish, criminally insane Satan worshipers (our assessment - 4thelostsheep.com. But, remember: our war isn't against flesh and blood - Ephesians 6:12). The time is coming and is now here when all people must choose to give allegiance to either their Creator Yahuah or His adversary. Whom will YOU choose to serve? U.S. soldiers and veterans expose globalist's agenda. Wake up, Americans. Your only hope now is what it's been all along: REPENTANCE from dead works and OBEDIENCE to your Creator! WORLD NEWS WATCH: How close are we to World War 3? Wake up, America!! Please watch and listen to this message from Glenn Beck. Those whom you call your leaders in Washington are backing Syrian rebels, who are members of Al Qaeda and the Muslim Brotherhood, the same enemies we fought in Iraq and Afghanistan. Wake up now!! Has war with Syria truly been averted? According to some, that remains to be seen. We understand from prophecy that there will be a World War 3, whether it's started with Syria or some other country, but it will be led by Europe - the "King of the North" - (read Daniel 11) against a Muslim confederacy - the "King of the South," perhaps the Muslim Brotherhood. Is war with Syria really all about Iran and Israel? Fox News' Judge Jeanine sets Obama straight on his proposed war with Syria. The American people don't want another war, especially if it involves Russia & Iran.